One of the most trusted and credible domains in the World is the .AC.UK domain name extension. Most academic establishments funded by the UK Government can use and benefit from a .ac.uk domain name for their website. Read more on why you can trust a .ac.uk domain. 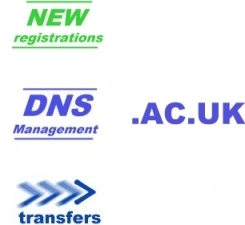 We can register your NEW academic .ac.uk domain for you; the charges for .ac.uk domain name renewal are every two years. We take you through the domain naming process and handle all the relevant correspondence, from and to the naming committee, for you; this helps ensure you have the best possible outcome when applying for a new .ac.uk domain name. Why use us to register your new AC.UK domain?